Drying corn on the hood of the family truck in Manyandzeni Village, Swaziland. 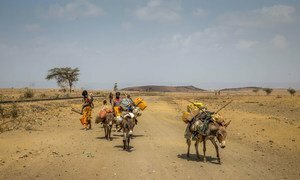 Thirty-four countries, including 27 in Africa, are currently in need of external assistance for food due to drought, flooding and civil conflicts, according to a new United Nations report released today. The figure has grown from 33 last December, after the addition of Swaziland, says the Food and Agriculture Organization (FAO) in its Crop Prospects and Food Situation report. (GIEWS), points out that drought associated with El Niño has “sharply reduced” 2016 crop production prospects in Southern Africa, while expectations for the harvest in Morocco and Algeria have been lowered due to dry conditions. Moreover, FAO stresses that persistent conflicts in Iraq, Syria, Yemen, Somalia, and the Central African Republic have taken a heavy toll on the agricultural sector, further worsening the humanitarian crisis in those countries. In most cases, the impact of conflict extends into neighbouring countries such as Cameroon and the Democratic Republic of Congo that are hosting refugee populations. Elsewhere, the outlook for the 2016 crops already in the ground, mostly winter grains in the northern hemisphere, is generally favourable. Early forecasts indicate large 2016 wheat crops in most countries of Asia. The 2015-2016 El Niño, one of the strongest on record, has passed its peak, but its humanitarian and economic impacts will continue for many months to come, the United Nations weather agency has announced, adding that lessons learned from this climate phenomenon would help build global resilience to weather related hazards.